The new era of adventures kicked in, but I can’t remember what came first, Game Boy Advance or Gamecube. I got My Gamecube at launch but not the GBA. I would check the receipt for the date that I purchased it, but it’s in the GBA box in the roof right now. I’ll lead with GBA though, as it was a split second decision to buy it, yet a mini adventure of it’s own. It was 2001, I was 16 and I had a job at the local pizza place, so I had a bit of coin. We were in the city for some reason, and were in Toys R Us. They had a huge display of GBAs set up in the middle of the electronic entertainment department. I remembered the ad’s I’d seen on TV for Mario Kart and Super Mario Advance. I remembered how funny and cool they were. I never had a Nintendo handheld before and had no real interest in them in the past. 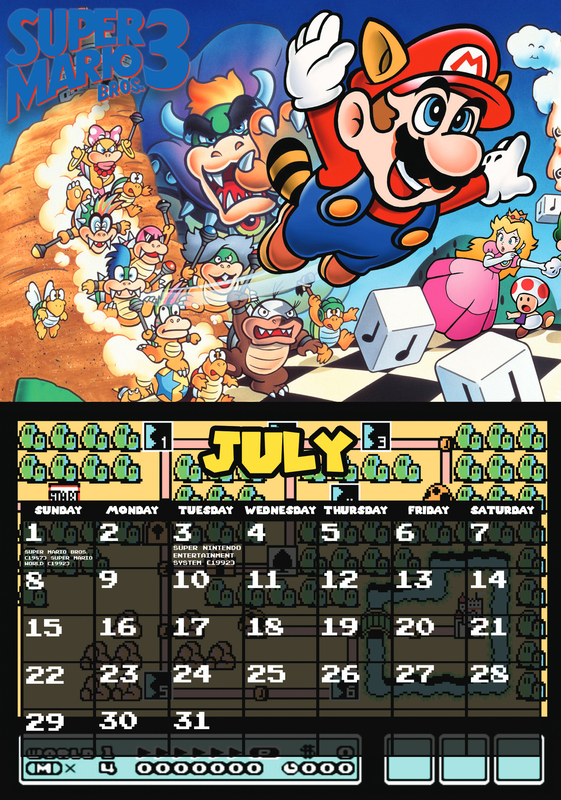 It’s the only time Nintendo marketing has needed to work on me, and it really did work. I bought a see-through purple console and Mario Kart. I had no idea what I’d gotten into. The only way I could see the screen was by sitting at the window with sunlight shining directly onto it. I didn’t care. I also got Super Mario Advance a week later. The Gamecube. I’m pretty sure this did come before the GBA because I remember it being the first console I ever bought with my own money. It wasn’t so much an adventure as other things, but the adventure mainly lay in the price drop wars with the Xbox before launch. I know that, once again, my brother and dad were with me, out on the hunt, looking for the best price. We did the rounds, but finally went with Harvey Norman, as they had the best price and had the bonus pre-order 8cm DVD to go along with it. We didn’t have a DVD player yet, but my older brothers computer had one. I remember watching the trailers every day for the weeks leading up to launch. School ended for the day and we went straight to Harvey Norman. I had come to accept the fact for the second console generation in a row, I wasn’t going to be able to have a game at launch. I discussed this with Ryan and we came to the agreement that we would pay half each for the Gamecube and I would eventually pay him back his part of the investment. This meant I could afford to get Star Wars Rogue Leader: Rogue Squadron II. 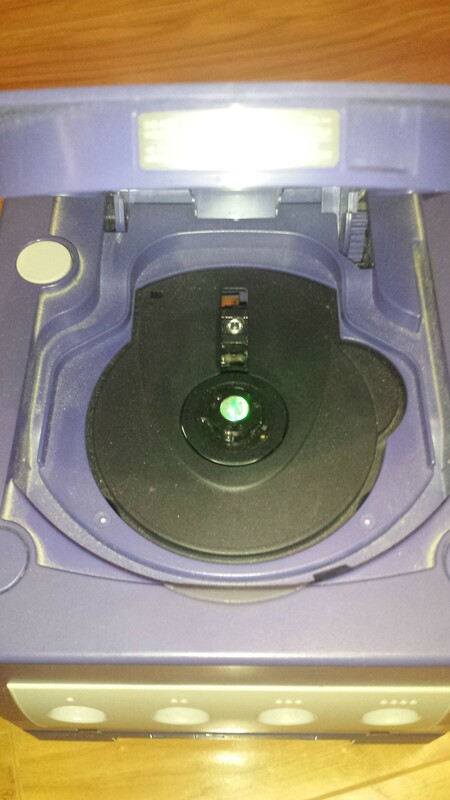 When we got home and set up the console, I remember the tiny little disc eject button in the disc tray and how shiny it was. I just went over and opened it now and it’s just a shiny today. The next Gamecube Adventure came two weeks later when Super Smash Bros. Melee was released. Ryan and I had convinced Dad to pitch in for a second controller if we bought Melee with our own money. At the time our older brother had a waste basket full of loose change. Dad said we should use that and he would pay him back. It was mostly made up of smaller coins, 10c, 20c and 50c. To make sure we had enough money, I called Harvey Norman and enquired about the prices. We started to count out the coins on the kitchen sink, until we had a plastic bag full of loose change to go with our own notes and coins. We got to Harvey’s, grabbed a copy of SSBM and a black controller to go with our indigo console. We took our goods up to the counter and the lady told us how much we owed. We gave her our share of the money and the big bag of change. She didn’t look too happy about it. She started to count the shrapnel. After about $10 she looked up at us and asked “Why is this money wet?” We started to laugh our asses off, realising that the sink must have been wet when we counted the money. We told her where we counted it and she looked rather unimpressed. I still find this hilarious today. Super Mario Sunshine was another adventure. It was October 4th 2002. Just now I checked Wikipedia for the release date and it says Sunshine wasn’t released until a week later on October the 11th. I think Kmart in Warwick broke street date. Could it be I was one of the first people in Australia to have AND to play this game? Now that I think about it, I believe that I was sold the game a week early. 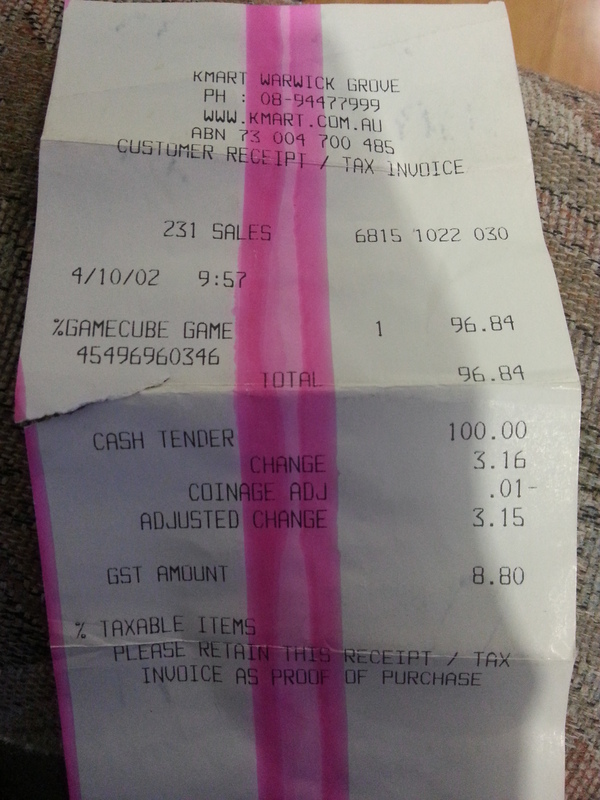 It only says ‘GAMECUBE GAME’ but this is my receipt for Super Mario Sunshine. Anyone else keep all their receipts? What time was it? ADVENTURE TIME! It was school holidays. Me and Ryan were at Dads that week. Dad was at work, so we had no way of getting to the shops except for walking. 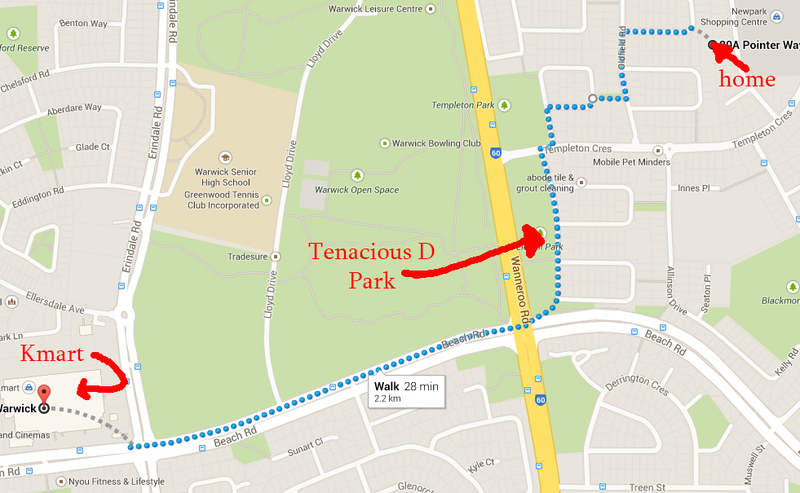 According to Google maps, it is 2.4km away, and should take about 32 minutes to walk there. It was however quite a bit uphill and a seemingly hot day. When we finally arrived we went straight to Kmart’s Gamecube section. The game wasn’t on the shelf. I went to the guy at the counter and told him that I had called earlier about Super Mario Sunshine. Unenthusiastically he looked at me and said “Yeah. We got it in today. It’s still out the back in a box.” I told him I wanted one. He went out the back and returned with a copy for me. The first half of the walk back was downhill and walking through the park I remember that both me and Ryan had Tenacious D’s Tribute stuck in our heads. It was odd that we were singing it. The rest of the walk home was uphill. It wasn’t fun. But finally we arrived and got to play the new Mario game. Another adventure for the Gamecube that I remember was Mario Kart Double Dash. It wasn’t too big of an adventure, as I did it solo. I had pre-ordered with EB Games in the city because they were offering a free racing wheel. I was pretty excited about this, because hey, a racing game with a racing wheel makes sense. I had to catch the train into the city to get my new game and bonus and had to carry it back on public transportation. When I got home and booted up the game, it was made apparent that the racing wheel was not natively compatible with the game. Pretty much the only thing that worked was the steering and pedals. Using items was with a face button and a the simple task of shooting a shell backwards required giving up steering to quickly press down on the d-pad with one hand and the item button with the other. NBA courtside was another small adventure. I was on my way visiting my Grandparents for the weekend and had to catch a train for about an hour to get there. I arrived at Fremantle station a little early and decided to go to Target and look at the video games. On sale was NBA Courtside 2002 for like $19. I enjoy basketball games as I had always played them with my older brother John. I didn’t have my Gamecube with me but decided I would buy it for when I got home. I lost track of time and my Nanna called me asking where I was. I didn’t realise I was now about 20 minutes late and they were waiting at the car park to pick me up. As the next few years rolled by there were more mini adventures, like the time I got Metroid prime and Spiderman 2, but really it was just me and Ryan walking to Toys R Us, which was across the road from the shopping centre that Mum was doing her grocery shopping at. Like I said nothing too memorable except the deciding whether or not I should by the game and being convinced by Ryan to do so. I’m sure there were other Gamecube related adventures but I can’t really remember them. If you would like to read on, click here! Otherwise wait until I link to it tomorrow.